Our Jet Ski Tours are ideal for corporate events of any kind, including building strong work teams, or rewarding outstanding employees as a corporate travel incentive and hosting and entertaining favorite clients. Your guests and clients will totally enjoy our excursions, which are both safe, unforgettable, and exciting. Instead of taking your clients to dinner (again), give them an unforgettable once-in-a-lifetime client entertainment experience. Witness the splendor of Manhattan, Ellis Island, and the majestic Statue of Liberty from the NYC harbor. Sea the City works closely with MICE agents to provide unforgettable entertainment for meetings, events, conferences outings and more. We presently have the largest fleet in the city, and we’re expanding every year with more jet skis on the water. Whether you’re a HR professional, team manager, or MICE agent we can help plan and execute your ideal corporate event here in NYC. Get a Quote Now! Group Rates Available! Largest & Highest Rated Fleet in the City! 1-hour jet ski tour of what made New York Harbor famous! Up to 48 people Our jumping off point is Liberty Landing Marina in New Jersey. 2-1/2 hour jet ski tour of New York City by water for up to 48 people. Our jumping off point is Liberty Landing Marina in New Jersey. Over the years, we have hosted numerous corporate events and team building encounters, featuring our exciting Jet Ski Tours. During the hot summer days, little is more welcome than our unique, cooling Jet Ski Tours around NYC waters. We have witnessed the many employee team bonding events and the incredible expressions of wonder and excitement of our clients during and after one of these unique tours. In fact, some NYC natives, as we are, marvel at the different perspective they get from viewing their city from the water. Whether corporations want a picnic for staff or celebrating a special milestone or occasion, our Jet Ski Tours will be the highlight of the event. NYC Client entertainment has never been as high octane as this. When you entertain your best clients, they will be impressed that you feature outside the box thinking to help them kick back and have fun. We’ll bet that they haven’t had a Jet Ski Tour of New York Harbor before. With the NYC skyline looming over the harbor, they will have stunning views of Manhattan while they cruise the waters surrounding the city. These Jet Ski Tours prove that you don’t just “talk the talk,” but you also “walk the walk.” Why not do something different for your next corporate event. Book a Jet Ski Tour of New York Harbor! Offer a corporate travel incentive no one will forget. Sea the City offers meetings and travel incentives experiences that will truly create a lasting image in your team’s mind. 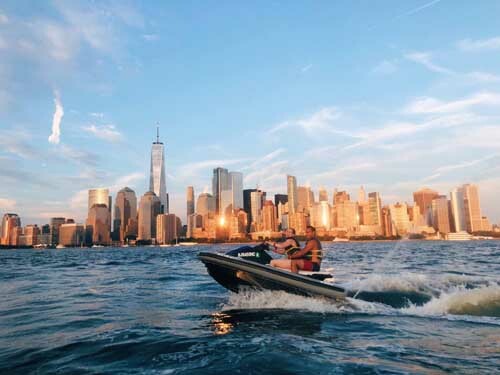 Unlike other tours of New York, Sea the City Jet Ski tours gives your top performer a view of the skyline like no other. Contact us today to learn more about offering our tours as a travel incentive.